It’s Friday! And I’ve finally found some time to write a blog post! I think that deserves something a little special, don’t you? So let’s talk cupcakes. 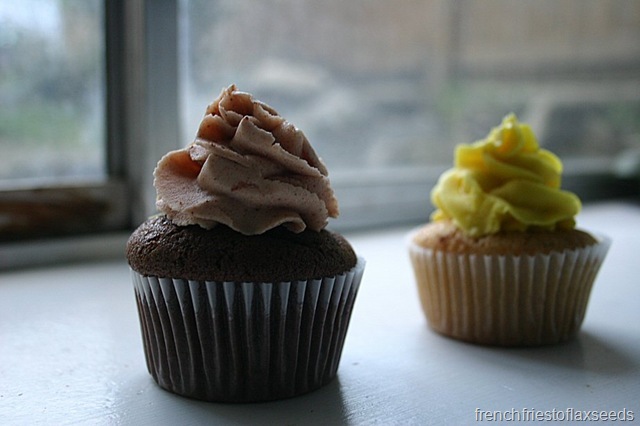 I had heard about Fairy Cakes Cupcakes over a year ago, even before they had opened for business. I was intrigued, as they aren’t just your standard cupcakerie (is that even a word?). Fairy Cakes Cupcakes are all nut-free (including peanuts), egg-free, dairy-free, and vegan (gluten-free are also available). Not only that, they strive to use as many organic, local, and fair-trade ingredients as possible in their baking creations. I finally found myself in their neighbourhood (Fraser St and 19th Avenue in Vancouver), and they were still open, so I took the opportunity to stop in and pick up a couple of treats. Because let’s face it – every once in awhile you need a cupcake…or two. 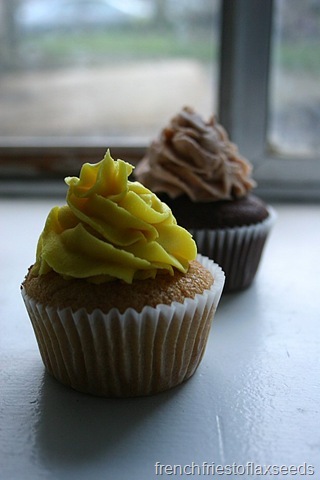 The first cupcake I chose was their lemon cupcake. I was a little confused when they asked me if I wanted chocolate or vanilla base. Here I thought I was getting a full on lemon cake topped with lemon icing. Hmm. I went with vanilla, since I didn’t think chocolate would really go. It was a nice, light cake. 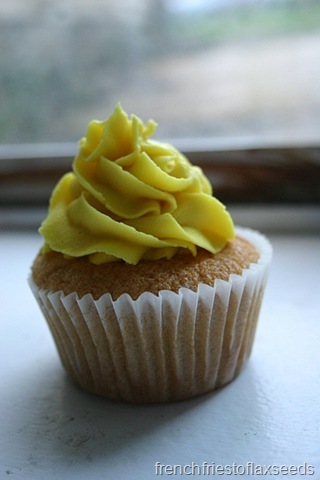 Good texture, moist, and a creamy, lemony frosting. 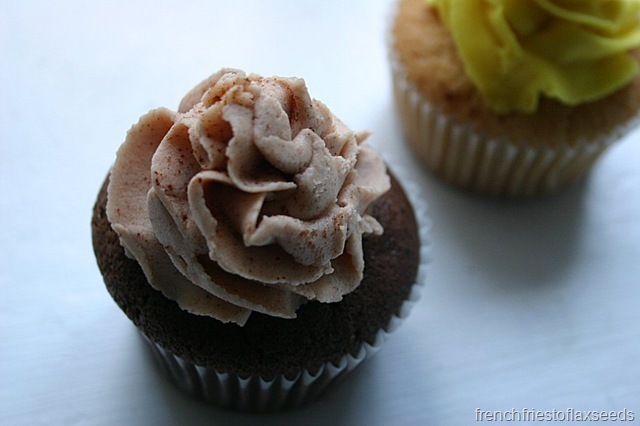 Cupcake number 2 (which I saved for the next day) was the Cinnamon Magic cupcake. Again, I was asked if I wanted chocolate or vanilla. This time I went with chocolate. I think because I saved this one the cake dried out on me a bit, as it found it crumbly, but not unpleasant. And the icing was delicious. I don’t know what they use, but their icing could pass for buttercream, that’s for sure. I thought these were pretty darn good cupcakes, and wouldn’t hesitate to recommend them to someone with allergies, who was vegan, or who just needed a sweet treat while passing through the neighbourhood. I would just like to see them get more creative with the cake flavours – chocolate and vanilla are great, but I think you really need to have unique cake flavours to go with each icing to take your cupcakerie to the next level. Hopefully that’s something they have in the works. 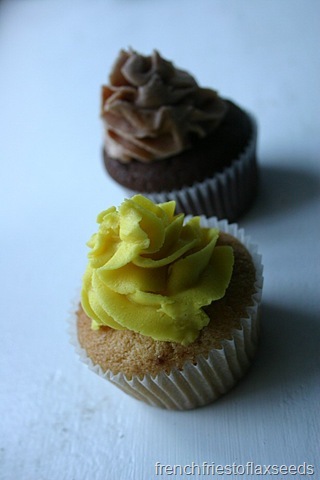 What’s your favourite cupcake and icing flavour combination? I’m always amazed at how good desserts with non-traditional ingredients can be. It sounds like they’ve mastered the art. I’m such a huge fan of cupcakes.